Ewelysses (right) with her lamb Eweclid. We buried our favorite ewe yesterday. Ten years old, Ewelysses died the way the old ewes always do: she just lay down one day and never got up again. It was in the middle of lambing season, and during her last days, the new lambs were coming into the world, playing and crying and sometimes jumping onto her back. Such is the nature of farming: so much life, so much death. Ewelysses was a favorite because she had personality. She had these crescent moons under her eyes and she had a sense of humor. She was also my first bottle lamb, born on the eve of the Valentine’s Day blizzard of 2007. I had to hold her in my arms to feed her during that first night, because she would not stand up to drink, but by the morning she was upright and bleating away, and by the second night she was already bounding out of her box. On the day of the blizzard, another pair of twins arrived. We had to dig a trench through the snow to get to the barn, which quickly filled up with snow again. We asked our tenant to come out to help us with the stubborn ewe, and waited almost an hour for him to make it from the house to the barn through the chest-deep snow. 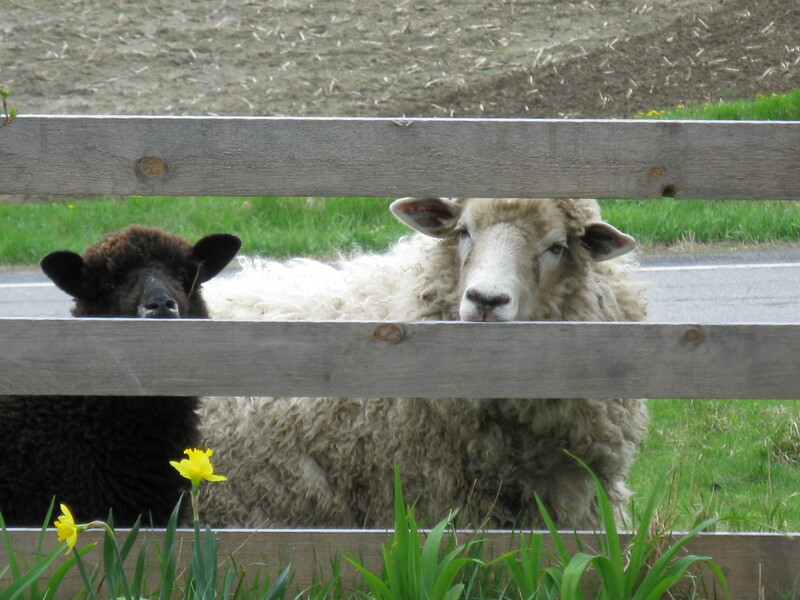 Our woodpile, the car, the fence posts, were all completely buried, and later, when the snow hardened, the sheep could walk right over the top of the paddock fence, trailing their lambs behind them. One of the new twins could not stand up; the ewe stood over him, pawing at the ground, as if to say, get up, get up. What else was she going to do? We decided to bring him inside to warm him up and soon he was up on his feet and ready to go. We brought him back out to the barn to his mother and hoped for the best. So we had two bottle lambs that winter and spring, Ewelysses and Rudy Valentino. with the animals, as the old poet said. We gave Ewelysses a forest burial. Art carried her through the rain in a garden cart across the muddy field to the edge of the woods, where he lay her down on the forest floor. The coyotes know the spot – it is our unwritten covenant with them. In a few days, there will be not a trace of her left. She will become a part of the forest, in the song of the coyote on the hill, in the black streak of a raven’s wing in its flight. Other than the snow and the hail and the rain, and her birth – a creature coming into existence from the watery, dark warmth of the womb, like a nimbus star– this will be the most wildness that she will ever know. And now that I come to mark the tenth anniversary of by brother’s death, I measure it in the length of a ewe’s life, and it feels too long, too much, to have passed so quickly. This small grief is cast like a shadow from a much larger one. An animal’s death occurs inside a circle of living and dying; I do not rage against it. But for a brother’s death before his time, there is no circle, no poetry, only these small consolations – a lamb falling asleep in a lap – that tether us to this world us as we stumble through our grief. Niles Lathem , June 21, 1955 – April 12, 2007. This entry was posted in grief, Uncategorized. Bookmark the permalink. Hard to imagine a more beautiful tribute, well done Lex. Niles was phenomenal. Brilliant writer, stunningly prolific and clever. We just don’t get the shooting stars for long.